I have the honor this week of posting from Gayla’s again. We’ve just spent the evening eating too much and laughing too loud, and tomorrow’s my last day here… so I’m going to keep this short to go to bed… soon. For once I managed to keep up with my long-aspired-to goal of turning in all my schoolwork on a Saturday, so last night we could write fiction. We only managed 150 or so words before we were dozing in front of our screens, but I have to say, her family’s implementation of a covered porch on a cool, Texas evening… is ideal for long conversations and creative spurs. Even if I do have a permanent lap attachment in her mini-chihuahua, Zeus. Since we spent today working on food, and are now worn out with over-worked stomachs, I’m down to a last-chance writing effort tomorrow, but I can’t even be upset about it because we’ve had so much fun. I even got to ride Solo this time. My visit has distracted me from grieving–even though when we planned this visit months ago that was not even on the radar as one of the reasons for it. Yesterday, hubs forwarded the link to an article about lifestyle factors that contribute to depression, and this trip affirms the importance of friends in helping counteract that inclination. So while I’m missing hubs and Natasha (who apparently decided yesterday she’d had enough of family leaving, and escaped to look for us, giving us all heart attacks until she was safely recaptured and returned home), changing up my routine once more has served as a welcome reminder about things that don’t change. And brings me to the quote the heartmath.org folks sent around on Facebook this week. I’m grateful for the set of people in my life who offer the hands (or shoulders, when necessary) who affirm the importance I sense of these heartfelt connections. That last is very much a stretch goal, since trying it last year was such a massive fail with the school requirements in place at that time. I have no idea what my final class’ requirements entail at this point, other than I’m assuming a capstone project is just a long paper. If that’s the case, and I can finish it early, I think my celebration will be to get drunk on fiction words. We’ll see how well I do given the anticipated distraction of welcoming a new puppy (or two?!) into the house in November, but I’ll keep you posted weekly here, regardless. 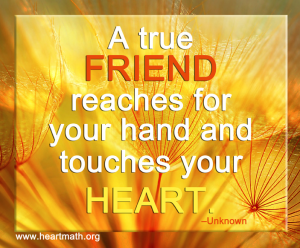 In the meantime, take a minute to let your friends know how they’ve touched your hearts. Yay for good friends! Good luck with your goals. I love NaNo for the encouragement and support it offers. The first time I did it a few years ago, I felt like I was not writing alone. Even though I was. Weird, but it is the magic of NaNoWriMo. I’m bejennie72 on the boards if you want a friend. Found you through ROW80. Very nice to meet you and I wish you the best of luck with your goals!